John Chisholm, a member of the Cathedral of St. Paul in Erie, PA, is an artist who has been exhibiting since the mid 1960s. He will be doing his 28th one man show, called “Zodiac Knots,” this coming September in Westfield, NY, and will be showing his piece The Cathedral Crest at the Cathedral’s art exhibition in honor of its centennial beginning at the end of July. John’s path to artistic success was not easy. He was abused as a child, arrested in the 1960s for protesting the Vietnam War, had cancer, and struggled with coming out and depression in his 40s. He also has had joyous experiences like his many art shows, judging art, publishing, and teaching. John taught for 50 years and is proud of the impact he has made. As in his art, he used his pain and hurt to help others and make himself a better teacher: “My life experiences have provided me with my material.” He sees his life as a series of beginnings and his art as a way to work through his life experiences, his beliefs, and his identity. One of those life experiences was his conversion to Christianity. Years ago in Florida, a friend, the conductor of a church choir, invited John to sing for a Christmas mass. Even though John was Jewish at the time he knew singing was good for his soul and agreed to do it. At the mass, during communion, John went up for a blessing. As the priest laid hands on him, John began to weep. He began attending the Episcopal Church following conversations with his rabbi. John now considers it home. Each piece John creates takes 60-80 hours. 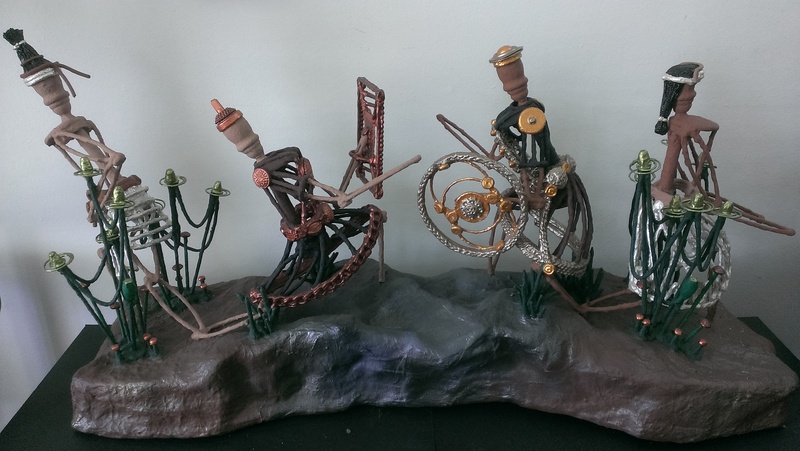 He begins with a sketch and then constructs each separate part of the piece with wire. He then has to glue them together, cover the piece with several coats of rubberized material, and, finally, paint it all. His art is three-dimensional and he believes that it touches people because it is more accessible and “that is what Jesus was about.” He creates his artwork because he feels it: “When I begin a new piece, my thoughts are going over a hymn or a message I heard in a sermon.” For example, his piece Shall Beat Their Swords into Plowshares, which he made for the Cathedral’s last art show, was inspired by the book of Isaiah. 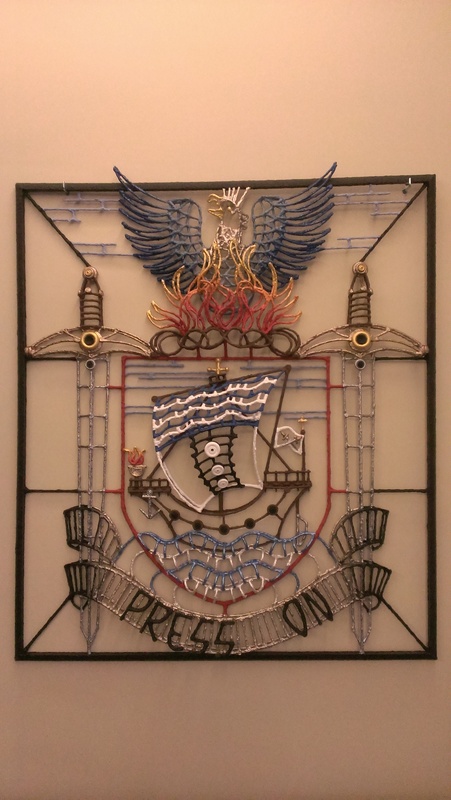 You can see John’s piece The Cathedral Crest as well as other great art at the Cathedral of St. Paul’s Centennial Homecoming on Saturday, July 25, at 5:00 pm and on Sunday, July 26, at the 8:00 am and 10:00 am liturgies. This entry was posted in Art, Events and tagged art, Cathedral, Cenntenial, Conversion, Crest, John Chisolm. Bookmark the permalink.